On January 8, 2015 Anchorage Police Department (APD) was contacted by Animal Control about a dog at a residence that may have been poisoned. Little Su, a 5 year old English Shepard, became sick after consuming a mixture of anti-freeze and chicken from a container near her home. She was taken to the vet by her owners. She passed away the evening of January 8th. 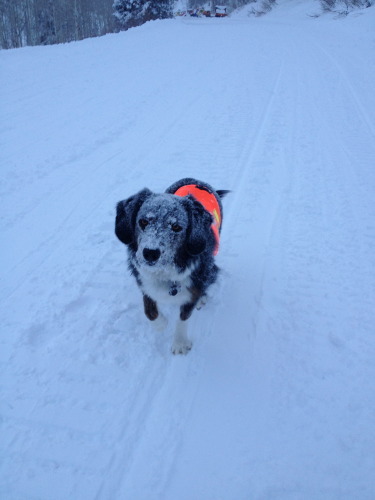 Little Su was a canine member of Alaska Search and Rescue Dogs (ASARD). She was operational in the disciplines of wilderness air scent and avalanche. Anyone with information on this case is asked to contact APD at (907) 786-8900 or Anchorage Crime Stoppers at (907) 561-STOP or online www.anchoragecrimestoppers.com. ASARD is offering a $5,000 reward for information leading to the conviction of the perpetrator of the poisoning of SAR canine Little Su. If you wish to help offset this cost, you can contribute to ASARD via our gofundme account for ASARD Little Su Reward or our Little Su Reward account at Alaska USA. If no convictions in this case have been made when the statute of limitations for this crime has passed, all funds donated for the reward will transfer to our general fund to support our mission and goals.